Mauritania is set to pick its first women's national team after putting in place measures designed to develop the women's game. With 100 days to go until the start of the Fifa Women's World Cup in France, the Mauritania Football Federation (Ffrim) says it wants to popularise women's football. "We have managed to reconcile the general public with men's football, the objective now is to unite this same public with the women's game," Ffrim said in a statement. "Ffrim is committed to the development of women's football, not only on the pitch but also the involvement of women in decision-making bodies within the federation. "Our mission is in line with Fifa's objective to advocate for football accessibility to the greatest number of young girls and women around the world." Abdallahi Diallo has been appointed as the first coach of the Mauritania women's national team. 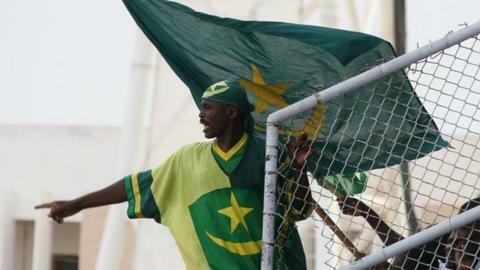 Mauritania has enjoyed recent success in the men's game, having qualified for June's Africa Cup of Nations - the first time the country has ever made it to the finals. A Department for Women's Football has been created to implement the plans and take charge of all activities involving the women's game. "We want to contribute to breaking down the socio-cultural barriers that hinder this discipline and to bring our women's football (up to) the same pace as our men's game," the Ffrim statement added.